Sat for two years behind All-Long Island stopper Kyle Turri but made most of his final season. Aggressive Brown-bound goalie challenged shooters and often triggered Lions’ fastbreak with long, precise outlet passes. Made 14 saves in state title game. Meet Newsday's 2012 All-Long Island boys lacrosse team, as selected by Bob Herzog and James Crepea. Dwyer led the offense of the No. 1 team in the country, scoring 39 goals to go with 75 assists (tied for best on Long Island) to finish with an Island-best 114 points. The Harvard-bound attack was impervious to double teams and moved the ball to his teammates with ease. The Trojans imperturbable leader on and off the field displayed poise, composure and patience while deciphering opposing defensive schemes and setup his teammates with awe-inspiring passes from all angles. 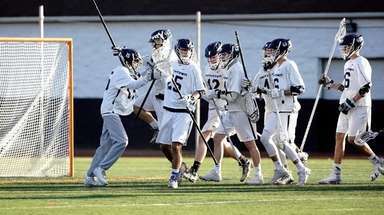 Dwyer had a goal and seven assists in a 14-4 rout of rival Yorktown in the state semifinals and two goals, including the game-winner, and added four assists in an 11-4 win over Irondequoit in the state final. 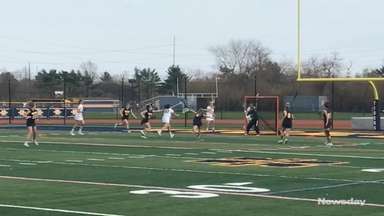 Garden City had an extra-man opportunity leading 4-3 early in the fourth quarter when Dwyer faked a pass while wrapping around the cage, faked a shot high and beat the goalie low to put the Trojans ahead of Irondequoit 5-3 and they never looked back. Scored seven goals in a 14-4 victory over Bayport-Blue Point in the Suffolk final. The Notre Dame-bound middie netted his first goal 13 seconds into the state Class C final, then suffered a concussion on a flagrant elbow. He tied for the team lead with 48 goals. The top-ranked recruit in the country and a three-time All-Long Island selection was an impenetrable wall on defense for the Indians. Duvnjak always drew the toughest offensive player and had few bad outings. He will play at Harvard. Froccaro scored an Island-best 67 goals while constantly drawing double teams. The Princeton-bound midfielder was also prolific at the faceoff and led the Vikings to the Nassau Class A semifinals. Also added 16 assists. His sharp-angle shot from the right with 13 seconds left dealt state Class A champ West Islip its only loss, 7-6, on March 31. The Michigan-bound Graham scored 24 goals and was the only All-American selection from the CHSAA. A lethal shooter, Guterding scored 52 goals and added 40 assists to finish No. 5 on Long Island in points (92) and help lead Garden City to a state title. The junior Duke-commit is a member of the Warrior 40. Even though every opponent knew he was the Eagles’ primary scoring threat, Llinares still managed to lead Suffolk in scoring with 106 points, including 59 goals. 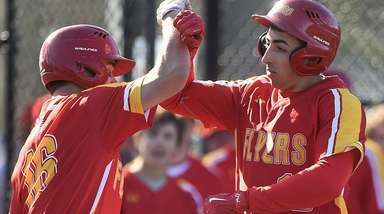 He set a school record with eight goals in an 18-12 victory over Islip on April 24. Scored an unassisted goal late in the fourth quarter to give the Flyers a 6-5 victory over St. Anthony’s in the first of three meetings between the CHSAA rivals. 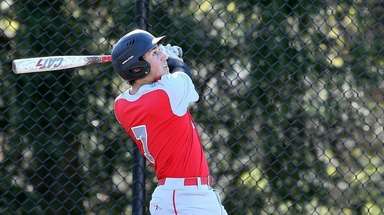 Lukacovic, a Virginia commit, led Chaminade in scoring with 62 points, including 34 goals. Marino had a stellar season and delivered when it mattered most in the state final, making all eight of his saves in a hectic second quarter. The Virginia-bound goalie was backstop to the lowest scoring defense in Nassau (4.77 goals). “He was our stabilizing force in every game, our offensive orchestrator,” coach Keith Wieczorek said of the Harvard-bound McDonagh. “He always drew the No. 1 defender.” McDonagh led the CHSAA champion Friars with 64 points, including 39 goals. Pannell drew so much defensive attention that teammate Matt Schultz was frequently the open man and wound up leading Suffolk with 64 goals. The Virginia-bound Pannell scored 74 points, including 43 goals. Two-time All-Long Island selection. Last year’s Long Island scoring leader (110 points) produced 91 points for the Class C state-champion Wildcats this season, including 48 goals and 43 assists. In state final, Rotanz, a Maryland commit, was MVP with five goals and two assists. Last year’s Long Island scoring leader (110 points) produced 91 points for the Class C state-champion Wildcats this season, including 48 goals and 43 assists. In the state final, Rotanz, a Maryland commit, was MVP with five goals and two assists. He guided West Islip to its ninth straight Suffolk crown, seventh LIC and fifth Class A state title in last seven years with 12-7 win over Ithaca. Gained 400th career victory on May 11. 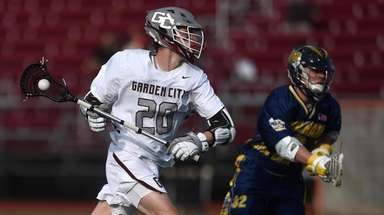 Took Garden City to the Class B state finals for the third year in a row and won his first state title, defeating Irondequoit 11-4, for the program’s fifth title and first since 2000. Matt Balzano, Wantagh, Midfield, Sr.
Jack Bruckner, Ward Melville, Midfield, Jr.
Matt Cossidente, Comsewogue, Attack, Sr.
Ryan Feit, Syosset, Goalie, Jr.
Tommy Forsberg, Glenn, Midfield, Sr.
Dan Fowler, Chaminade, Goalie, Jr.
Liam Kennedy, Garden City, Attack, Sr.
Chris Mahoney, Shoreham-Wading River, Defense, Sr.
Tom Moore, West Islip, Attack, Sr.
Quinn Moroney, Manhasset, Attack, Sr.
Ryan Palasek, Rocky Point, Defense, Sr.
Matt Schultz, Smithtown West, Attack, Sr.
Brian Sherlock, St. Anthony’s, Midfield, Sr.
Zach Sirico, Sayville, Attack, Jr.
Brian Ward, Bayport-Blue Point, Attack, Jr.
Newsday's 2012 All-Long Island boys lacrosse team. Front row, left-to-right: Nassau Coach of the Year Steve Finnell, Bobby Duvnjak, Jack Kelly, Sam Llinares, Anthony Santo, Devin Dwyer, Suffolk Coach of the Year Scott Craig. Second row, left-to-right: Tim Rotanz, Trevor Brosco, Matt Graham, Dan Marino, James Pannell, Ryan Lukavic. Back row, left-to-right: Justin Gutterding, Sean McDonagh, Jake Fraccaro.